The classic Italian dish pasta Bolognese comes with a stringent set of rules, but the chefs here aren’t afraid of breaking them. Yes, this classic Italian dish comes with a stringent set of rules, but the chefs here aren’t afraid of breaking them. At his restaurants, the New York megachef adds venison, chicken liver, porcini mushrooms, chestnuts and butternut squash to his Bolognese. This recipe cuts a few ingredients (but not the chestnuts!) to make it simpler but still delicious. This mash-up of Bolognese with tallarín saltado, a Peruvian comfort food, from LA chef Ricardo Zarate is insanely delicious. He adds a ginger-garlic sauce flavored with gently spicy aji amarillo paste. 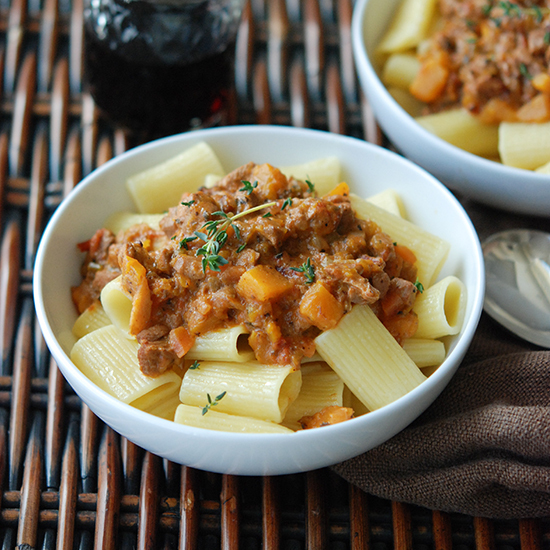 TV chef Andrew Zimmern makes an extra-luscious Bolognese with veal, squash and cream. Since Bolognese is a meat sauce more than a tomato sauce, Mario Batali forgoes the soupy canned tomatoes in favor of concentrated tomato paste. OK, if this sauce is more about the meat, how do you make it without? Chef Sarah Grueneberg makes a delicious and compelling vegetarian version with finely chopped mushrooms and porcini liquid.